Spanner in the Workz: Tool Order/ Occupational Hazard! Ah, the unexpected benefits of working in a bookstore! Whilst browsing various arts publishers’ catalogues for new and future releases I discovered a book titled, ‘Tools: Extending our reach’, the accompanying publication for the exhibition of the same name at the Cooper Hewitt Smithsonian Design Museum in New York. A fantastic find, as I have continued to collate various tool related research on the blog since finishing my degree (which, you guessed it, focused on tools as subject matter). Collectively I probably have already amassed quite a broad archive of tool related artists, exhibitions and their cultural, historical associations and am unsure if it has purpose other than as a growing resource for future use or for anyone else researching the same thing. Visually, at least, I do know that it fuels ideas for future drawings/ways of looking at tools themselves (but more on that later). In the unlikely event of being able to afford to go to the states to see the actual exhibition, the catalogue is pretty much the next best thing! The Cooper Hewitt is a design museum so as you can expect that there is much emphasis placed on the idea of ‘function informing form’ (and vice versa) with over 175 objects chosen for this exhibition that aims to represent a fraction of creations humans have ‘devised to engage with the world’. However the curators have been quite broad and questioning in their choices of defining ‘what a tool is’ describing them as ‘virtually anything that aids us in accomplishing a task’. This opens the enquiry to everything from the earliest known flint tools, to fishing hooks, spears, maps, telescopes, gloves, needles, clothes pegs, common modern hand tools; to artificial hearts, prosthetics, laptops and robotic bees*! Their modern day counterpoints; technology such as Smartphones contain many of the functions and applications of tools themselves but in a digital format/programme, which in turn is changing how we interact with the world; how we produce food, how we build and create, but also how we interact with each other (in both cases arguably not always to beneficial effect, indeed more technology has often led to creating of new problems that in turn need solving). Although there is an appreciation in this exhibition of looking at the old in order to inform the new, with the seemingly simplicity of a wooden abacus being as valued as its modern evolution of a calculator or a Marshall Islands stick navigation chart being the predecessor of the contour lines and routes of paper mapping. Sometimes the modern design is even trying to replicate the simplicity for purpose found in ancient objects such as a Neolithic hand axe being the inspiration for a similar shaped modern chef knife for chopping. As the curators Cara McCarthy and Matilda McQuaid outline in the opening statement introducing this exhibition “[tools] are often equated with technology and engineering, but many acquire meaning through aesthetics, the economy of their design, the cultural significance of their materials...” In an attempt to create awareness of the breadth of how/why tools are made, the curators have divided them into seven categories: work, communicate, survive, measure, make, toolboxes and observe. From what I gather this virtually covers all aspects of life (medicine, food, shelter, clothing, communication, trade etc.) and if you take only one thing away with you from this exhibition it’s the understanding of just how vast the range, creativity and industriousness of tool production has been and continues to grow and evolve at incredible pace. Any ethical, philosophical, psychological or environmental judgements to be made on any of these objects or adversely the effects that they may/may not be having on us and our environment are largely left to the imagination of the viewer in favour for more dialogue on the design, aesthetics, engineering and functionality of the tools presented. This is where having more tool related work by artists as part of this exhibition would have perhaps prompted some of those debates and alternative ways of understanding the cultural, sociological, political and environmental applications of the tools and people who make/weld them. I am being unfairly ambitious in my expectations, but there has yet to be a tool exhibition that covers all aspects of both design, history and their implications on the world. Thankfully the inclusion of the Mexican artist, Damian Ortega’s ‘Controller of the Universe’** a suspended installation of hand tools in the form of an explosion [images found on link below], is at worst within this particular exhibition a dynamic, fun piece of marketing eye-candy but at its best suggests an alternative way of looking at tools, “they extend our body’s ability to do things and at the same time come between us and our direct experience of the action”. 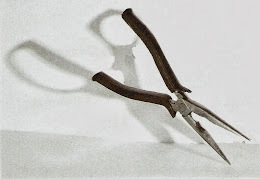 Walker Evans 'Beauties of the Common Tool' 1955 Gelatin silver print 25 x 20.2cm. "Ultimately, what Evans valued was the design, the construction that resulted from the maker's understanding of function, efficiency of form, and material." 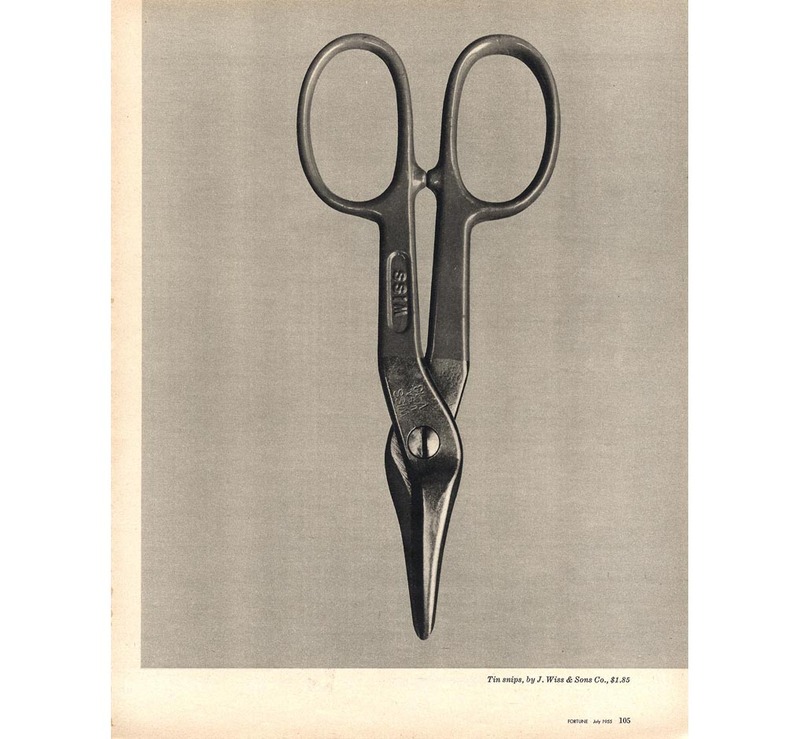 The highlight of the exhibition catalogue for me was discovering the photographic prints of everyday hand tools by American photographer Walker Evans [1903-1975] who produced the photographic essay 'Beauties of the Common Tool' in the 1955 issue of Fortune magazine. 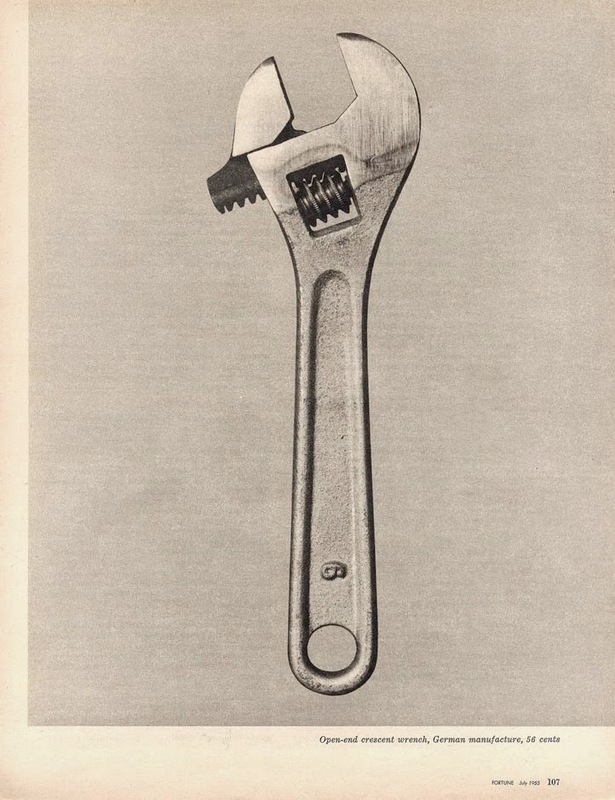 He described hardware stores as "offbeat museum shows" and I couldn't help but notice the connection that these images have to the printmaker Jim Dine's treatment of presenting tools in a state of static isolation (around the same time). The similarity is exciting if a little uncanny. Nonetheless it is very interesting to think that other artists were thinking/noticing and perhaps even responding indirectly to each others work/similar ideas around the same time. Whilst Dine's tools are imbued with an emotional intensity these have an analytical intensity to them in which every detail, their shape, patina and material are really prominent. In a way its as though they are more real than the tools themselves which is a concept worth more attention at another date. The fact remains that tools are progressive and innovative objects, ‘designed to bring about change’ and as much as they are about creating they can also be about destroying which symbolically for me in my art, they share or act as a metaphor for a lot of the values I associate with art as a subject such as ideas of creativity/destruction, potentiality, alteration and disruption. In the same way tools as well as art have the means to expand our everyday limitations of experience/perception/interaction with the world. I have long speculated why I hold a fascination with drawing tools, but am beginning to think that the intensity invested in drawing these objects has always been an attempt to emphasise the reverence and importance I place not upon the tools but the tools as a symbol for art itself. That still doesn’t account for why I draw certain tools over others, I speculate that maybe I see similar qualities in the hand tools I choose to draw with qualities/traits I see in their owners or perhaps even myself. In that sense maybe they become more like portraits? I’m still undecided, but I'll enjoy finding out. 'Tools: Extending our reach' is on at the Cooper Hewitt Museum, New York until May 25th 2015 and if you can't see it then its well worth getting the catalogue!